Nike unveiled this season's series of Pro Combat football uniforms on Wednesday morning. If you think football is kind of like a video game played by superheroes, these designs are for you; if you think football is a sport played by athletes, you may react a bit less enthusiastically. The usual Uni Watch litmus test -- "Is it good or is it stupid?" -- doesn't really apply here, because all these designs are stupid. They have no reason to exist, except as a function of Nike's hype machine. So instead we'll rate how high they score in terms of ROIG Rage, which stands for how vigorously a typical middle-aged alumnus of the school would be Rolling Over In his Grave after seeing the design. Of course, a middle-aged alumnus is probably alive, not in his grave, but Uni Watch doesn't like to let inconvenient facts get in the way of a snappy acronym. So without further ado, here are the 10 schools, slideshows of their Pro Combat uniforms, the dates on which those uniforms will be worn, some quick Uni Watch reactions, and the ROIG Rage ratings, on a scale of 1 to 10. When it will be worn: Nov. 13, against Mississippi State. Uni Watch says: Most sedate design of the bunch. ... Bear Bryant-inspired houndstooth pattern on the numbers and helmet stripe is a nice enough touch, although it probably won't be visible on TV. ... Too bad about the truncated pants piping. ... Before everyone starts screaming about the flag patch being backward, it's not backward. It's traditional for the stars to be worn facing forward, just like in the military. ... ROIG Rage Factor: 2. When it will be worn: Labor Day, against Virginia Tech. Uni Watch says: You can lead a horse to water -- or a Bronco, in this case -- but you can't make it think. ... Pretty disastrous set, what with the drab gray jersey, the mismatched jersey sleeves, the "B" on the knee, and all the rest. But let's face it, nobody was expecting a traditional look from the school with the blue turf. ... The helmet, with the bronco on one side and the off-center uni number on the back, is actually pretty cool -- easily the best part of the package. You can see a full-rotation video clip of it here. ... ROIG Rage Factor: 8 (would be higher, but most Boise State alums are probably numb to this kind of stuff by now). When it will be worn: Oct. 30, against Georgia. Uni Watch says: Not so bad, if you ignore those miserable stripes on the pants. ... Lots of "gator skin" patterning on the numbers, on the undersleeves, and even on the helmet. ... Certainly better than the Pro Combat design they wore last year. ... ROIG Rage Factor: 2. Uni Watch says: Well, at least the Canes' receivers should be easy to spot downfield. 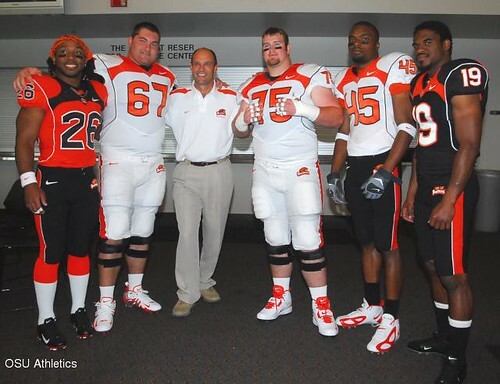 The orange jersey wouldn't be bad with white pants, or vicey-versey, but orange-on-orange is a bit much, no? ... Hey, if you want to wear what looks like a "The U" fanny pack, be my guest. ... On the plus side, love the green helmet. ... Also digging the shoes/socks combo, but that's sort of in the "Too little, too late" category. ... ROIG Rage Factor: 7. When it will be worn: Nov. 27, against Michigan. Uni Watch says: Throwback-ish tribute to the 1942 squad is a nice idea, but the execution feels lacking. ... Gray pants + gray socks = one mighty grim look below the waist. ... Socks have "1942" woven in upside-down, which is supposed to inspire the players when they're suiting up, or something like that. ... As with the Bama uni, the American flag sleeve patch is not backward -- it's supposed to be that way. ... Best element: the bronze star decal on the helmet, a tribute to Charles Csuri, who played on the '42 team, earned a Bronze Star in World War II, and still teaches at the university. ... ROIG Rage Factor: 5. When it will be worn: Dec. 4, against Oregon. Uni Watch says: Surprisingly old-school, no? ... Hard to believe this is the same school that wore that sports bra design a few years back. ... A few minutes before the unveiling, a guy from Nike introduced himself to me, pointed at this design, and said, "I worked on all of these, and this is the best one of the bunch." Hard to disagree. ... Matte-finish helmet is interesting. ... Putting the sleeve stripes on the undersleeves, instead of on the actual jersey, is probably the future of football striping. ... ROIG Rage Factor: 0. When it will be worn: Nov. 26, against West Virginia. Uni Watch says: That anguished sound you hear in the background is all the disappointed fans who were hoping that the helmet would feature the old Pitt script logo. ... The script would've been nice, but the steel girder font on the helmet is actually pretty cool. ... Too bad everything else about the design feels so Dark Knight-esque. ... A couple of Pitt guys at the unveiling told me that the jersey was supposed to include some sort of panther-fur pattern, but I guess that got left on the drawing board. ... ROIG Rage Factor: 7. When it will be worn: This Saturday, against Oregon State. Uni Watch says: Great horned toads frogs! ... Didn't think they could come up with something uglier than last year's Pro Combat design, but somehow they managed. ... An instant classic of its type. ... ROIG Rage Factor: 9. When it will be worn: Labor Day, against Boise State. Uni Watch says: Hey, they got the helmet wrong! ... We're all supposed to hate this one, so I looked long and hard to find something positive to say about it, just for variety's sake, but I came up empty. ... Putting this uni on the same field with the Boise State design on Labor Day should rank up there among the most unsightly games in college football history, but fortunately most of us will be busy with backyard barbecue parties. ... ROIG Rage Factor: 10. When it will be worn: Nov. 26, against Pitt. Uni Watch says: Seems kinda plain Jane, no? ... The smudged uni numbers are supposed to evoke West Virginia's coal mining heritage, and the yellow trim is supposed to represent the canary in the coal mine, but maybe they should've just used a black lung-shaped patch instead. ... Navy helmet logo doesn't really work on the charcoal helmet background. ... ROIG Rage Factor: 4. • Baylor, in addition to adding the green pants that were mentioned in the big roundup column, will wear a camouflage-accented helmet design on Sept. 11. • This isn't exactly a uniform change per se, but it's worth noting that Oregon's "carbon fiber" helmet, which was unveiled last year but never worn in a game, is expected to make its on-field debut this season. • Purdue will be wearing 2001 Rose Bowl throwbacks for the homecoming game against Minnesota on Oct. 16. 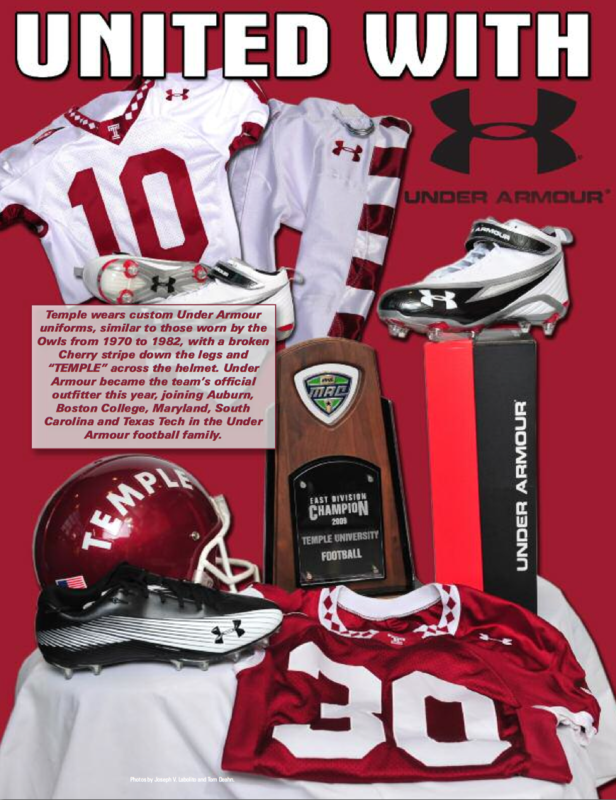 • Temple has changed from adidas to Under Armour, but the only change to the uni is the addition of the UA logo. Do you know of any additional FBS schools with uni changes that weren't covered in either of this week's columns? If so, please speak up. Paul Lukas was in such a hurry to get this column written for you that he skipped the free lunch buffet at the unveiling. 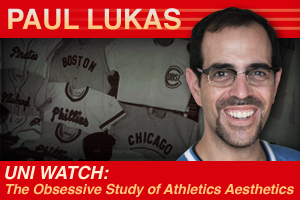 If you liked this column, you'll probably like his Uni Watch Blog, plus you can follow him on Twitter and Facebook. 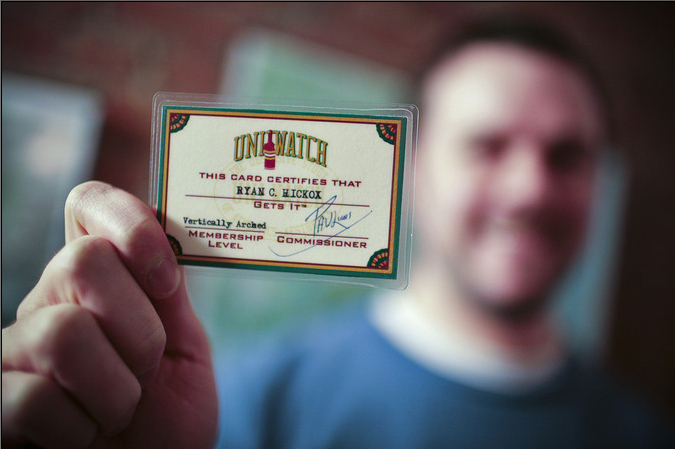 Want to learn about his Uni Watch Membership Program, be added to his mailing list so you'll always know when a new column has been posted, or just ask him a question? Contact him here.